Some beauty bloggers have been writing about EVERY MAN JACK for sometime now. And while at my friend's home I was able to try this. Is everyone hip to the hottest products but me? I tried the cedarwood bars. I have to say, the bars are really beautiful, masculine, and look like pieces of well polished wood. Smell was very faint, but okay. This is pretty much a regular no-frills bar of soap, but with added fragrances, both artificial and natural. Personally, I think the best soaps should do without these ingredients. In reality, however, fragrance is indeed a huge part of what sells a product. The fragrance also doesn't last well in this bar soap either. The downside was that it washed like any 50 cent glycerin soap bar. Bottom line, this is just a regular (inexpensive) glycerin soap. It has no additional moisturizers or deodorants. So what seems like a bargain at 3 for $5 is actually not. You can buy regular glycerin soap bars for significantly less. This isn't a product I'd use myself (probably ever again), but it is definitely a very expensive and masculine looking bar of soap, and at 3 for five bucks, I think it'd be a great decorative soap for male guests (or to fit in a natural/woodsy decor). Please note, after using the soap even once or twice, it will lose its look of "wood" and just turn into a regular and unremarkable little bar of soap. Sorry EVERY MAN JACK, but I'm must be an exception. I am not jack. Thumbs down overall from me. This is just my personal aesthetic opinion in using this prouduct. This is not in any way a scientific evaluation. I have no financial/personal/professional association with Every Man Jack. Product tested was a friend's. 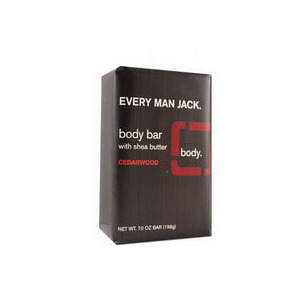 I wanted to take a moment to respond to your feedback on the Every Man Jack Body Bars. First, I'm glad to see you interacting with the brand. The response from bloggers, and consumers in alike, has been tremendous. We don't just have returning customers; we have loyal followers. - in their soap. Additionally, tallow is considered comedogenic, which can tend to produce or aggravate acne. Every Man Jack is a leading, all-natural grooming brand. As such, we don't use tallow, or any animal byproducts, in any of our products. Instead, our Body Bars have a vegetable base, resulting in a slightly higher price point. We still feel like it's a great value; each piece in the line is $4.99 at your local Target. Lastly, the wood graining on the soaps is purely decorative. One thing you'll notice is that as the soap dries between uses, the edges will begin to crack slightly, producing a stunning wood-like affect. It looks like a piece of lumber that has been weathered, which creates a strong, masculine look, especially when displayed alongside the other wood-grained packaging. With that said, I invite you to try other products from the Every Man Jack family, including our other award-winning Body Bars and shave products. I'd be happy to supply you with a complete collection. I can't believe you think $1.67 for a bar of soap is expensive. soap cracked at the edges looks old, unused, and icky. I wouldn't consider that a selling point, even for men.